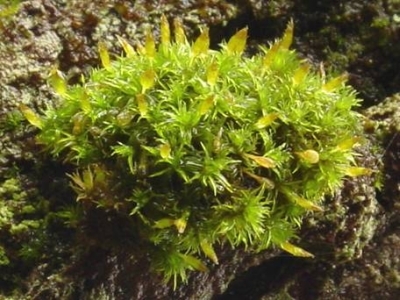 Ulota and Orthotrichum are two moss genera commonly found as epiphytes (epi = upon, phyte = plant) on hardwood trees in our area. These two genera are closely related and both are members of the family Orthotrichaceae. They can be seen throughout the winter in their cheerful green cushions often sporting sporophytes with beautiful hats. These “hats” called calyptrae (sing. calyptra) are the remnant of the top part of the archegonium (the ancient vessel), which held the egg that was fertilized to produce the sporophyte. The sporophyte has several other parts including the long stalk called a seta and the spore case (sporangium) often called a capsule. 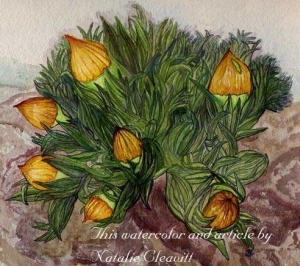 In this sketch of Orthotrichum speciosum adapted from Draper et al. 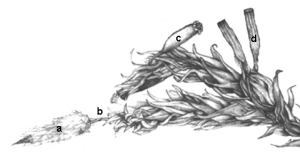 (2003), several sporophyte characters discussed in the article are labeled: a. hairy calyptra, b. seta (plural setae), c. capsule without ribs and d. capsule with ribs visible as darker stripes. The most common member of the family in the area is in the genus Ulota - Ulota crispa (see photo). As the species name implies, the leaves on this moss are crisped, that is, curled inward and around one another when the plants are dry. On old sugar maples, you may also see Ulota coarctata with longer setae and more puckered, smooth capsules than U. crispa. The crisped leaf habit of these two species of Ulota contrasts with Orthotrichum which has straighter (erect) leaves wet or dry. Another difference between Ulota and Orthotrichum is that Ulota capsules are always exserted beyond the upper leaves, while in species of Orthotrichum the capsules are often partly hidden by the upper leaves. If you have a hand lens, you might also look at the shape of the leaves on your moss cushion. The leaves of Ulota are longer and more linear, while those of Orthotrichum tend to round outward in the middle and back up to the tip giving Orthotrichum stems a chubbier look. There are several common species of Orthotrichum in the area including O. pusillum (illustrated here). Many microscopic features are generally used to distinguish between species of Orthotrichum, but here I attempted to make a field key to species of Orthotrichum that you are likely to see on hardwood trees in the Finger Lakes region. Please give it a try and let me know what you find! This key benefited from comments by Sue Williams and was constructed with reference to Crum and Anderson (1981). Crum, HA and LE Anderson.1981.Mosses of eastern North America, volume 2. Columbia University Press. Draper, I, F Lara, B Albertos, R Garilett and V Mazimpaka. 2003. "The epiphytic bryoflora of the Jbel Bouhalla (Rif, Morocco), including a new variety of moss, Orthotrichum speciosum var. brevisetum". Journal of Bryology 25:271-280.